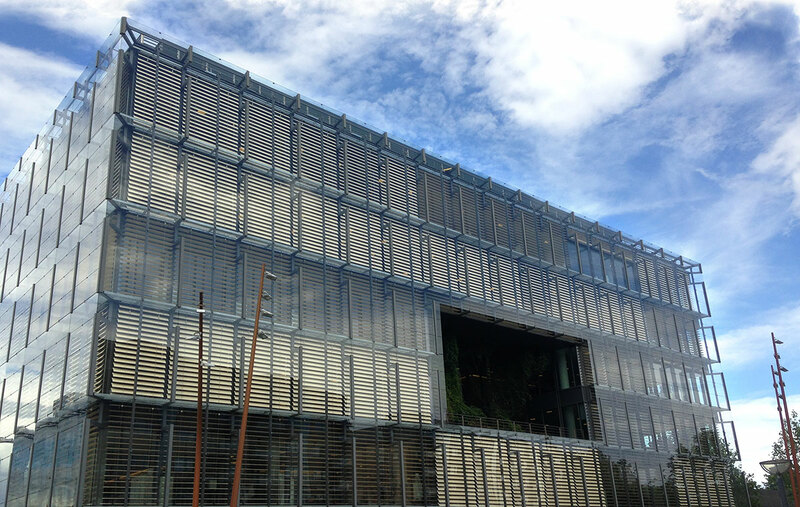 Movable, tilting ”synchro blinds” for external use, double facades – and indoor. Reduced, pure design with an absolute minimum of cords, strings – and without holes in the slats. The clean slat surfaces without holes and with support points in channels in the slat undersides make the synchro blinds extremely easy to clean – and exchange of the slats quick, simple and easy. Slat widths from 50 mm up to more than 300 mm. The big lifting height and the high weight capacity makes it possible to use wide and heavy slats in new materials and new technologies, i.e. perforated, acoustic damping undersides; glass; composite materials; or integrated solar cells.